"Merry Christmas and Welcome Home!" If an artfully decorated Christmas porch could talk, we're sure that's what it would say! 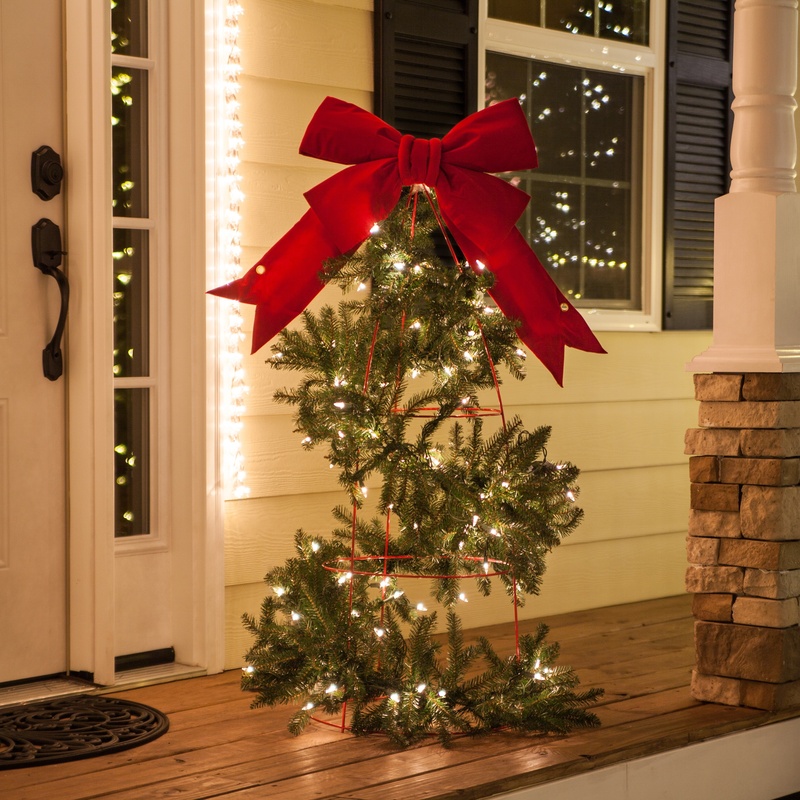 Your front porch is often the first place you welcome visitors to your home and a perfect backdrop to share your Christmas cheer with the neighborhood too! If you're searching for a striking addition to your existing holiday porch design or celebrating your first Christmas in a new home, we've come up with Christmas porch decoration ideas that will spark your creative side. Discover the inspiration that speaks to you and experience the festive spirit of the holidays every time you, your family and guests arrive to your home this Christmas! "Merry Christmas and Welcome Home!" If an artfully decorated Christmas porch could talk, we're sure that's what it would say! If you're searching for a striking addition to your existing holiday porch design or celebrating your first Christmas in a new home, we've come up with Christmas porch decoration ideas that will spark your creative side. The front door of your home is the focal point of your entry and often the first place that is met by the eyes. Keeping this in mind when planning your Christmas porch decorations, it is helpful to visualize your design from the center, outward beginning with the door. Even if you don't have a porch or you don't want to decorate your entry too heavily, you still have a door! The front door offers a wealth of opportunity for inspiring holiday cheer every time you arrive home and your neighbors drive by. You can decorate directly on your front door, flank each side or both! 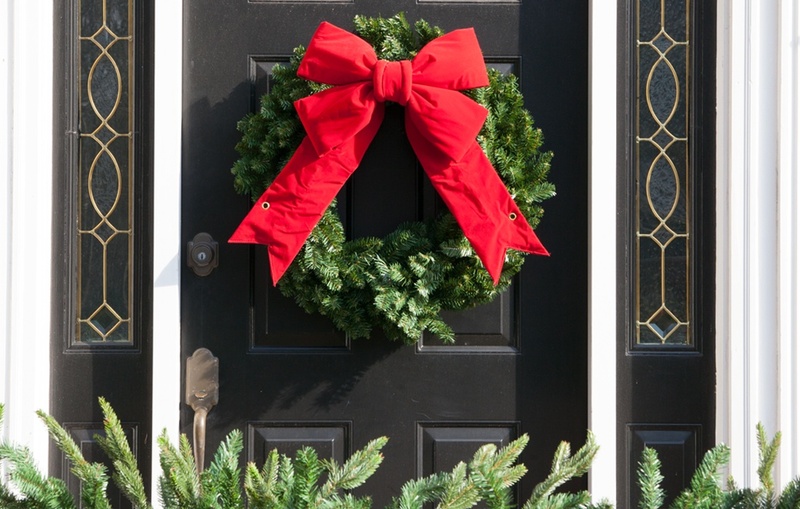 Try outlining the trim of your door with garland to complete your door design! The secret to creating perfectly placed garland around your door is to skip the hammer and nails or hooks and use a garland hanger instead. 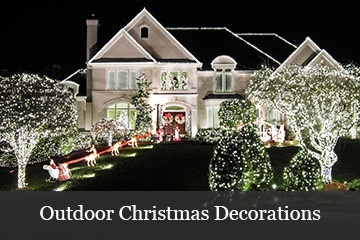 Installation is as easy as 1,2,3 and your garland will lay perfectly in place all season long! If you want your holiday door display to shine bright at night too, consider wrapping mini lights around your greenery or choosing prelit wreaths and garland when selecting your holiday decor. Greenery isn't quite your style? 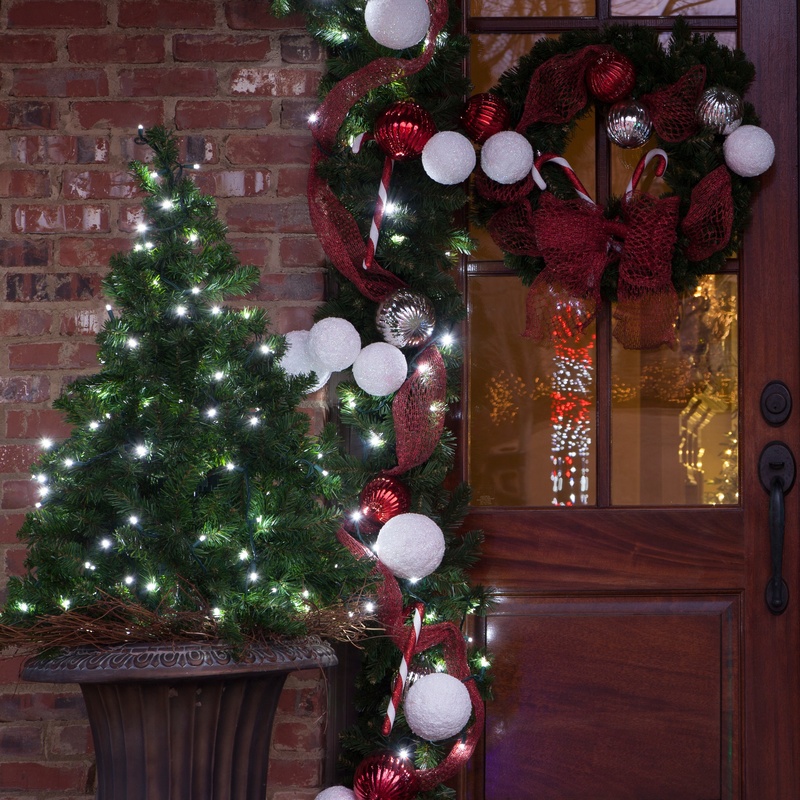 Garland lights offer an eye catching alternative for outlining your door! Holiday greenery is a Christmas classic and can carry any theme well. A simple green wreath adorned with a red bow stands out against any door color and design while maintaining a traditional Christmas feel. If you favor the timeless look of greenery but want to add a bit of your own vibrant personality to your front space, incorporating themed accents, such as ribbon, ornaments, flowers or even your prized owl figurines or beach shell collection, can turn basic holiday greenery into a rustic, modern, vintage or one of a kind design! Tip: Keep in mind the idea of working from the center outward and try to carry the same theme throughout your entire Christmas porch design. Sticking with one theme helps to unify your design and create curb appeal worthy of magazine covers! What does this mean for those of us who chose a beach shell theme? An excuse to head back to the ocean for more decorations! Benches, swings and rocking chairs are inviting additions to thousands of porches, so why not show our favorite front row seats some holiday love too? 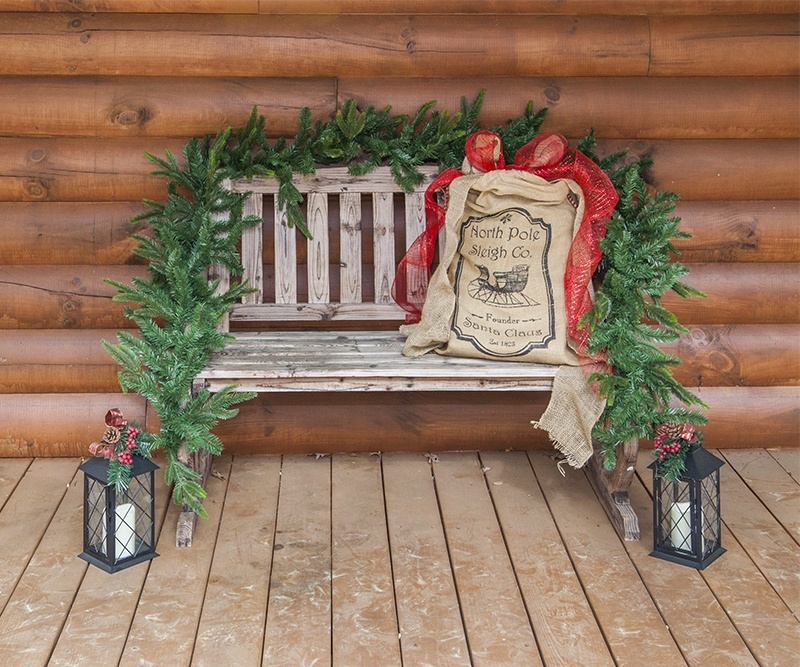 Wrap porch seating in lit or unlit garland to finish off a festive porch display. You can add your own special touches like bows, bags, lanterns and maybe even a jolly sitting santa to greet your guests as they arrive. Benches and swings can also be draped or wrapped with string lights to create extra illumination near the door! To continue working outward across your porch, flanking each side of the door with decorative accents can add depth to your door design and close the gap if your garland doesn't quite reach the floor. Flanking works especially well with doors that feature sidelites, or window panels to the left and right. Choose decorative accents that stand even in height with the center of your door to create a polished, symmetrical effect. Below are a few Christmas porch decoration door flanking ideas, but there are certainly many others and you can be as creative as you like here! 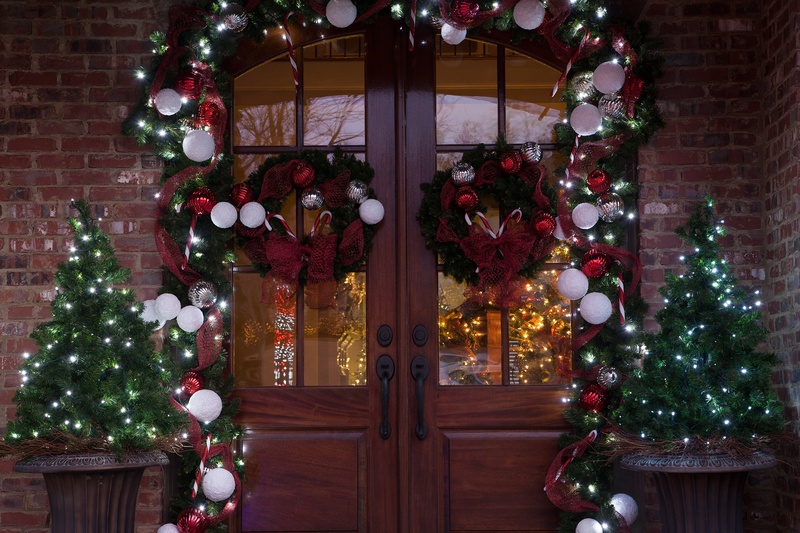 Place lighted motifs like angels, snowmen, reindeer or elves on each side of your door. Potted topiaries wrapped with coordinating lights. Grapevine balls wrapped with lights and placed in matching urns. Tip: If your home doesn't have a porch leading up to the front door, you can still flank each side of your walkway! Try placing lighted walkway trees or starlight stakes on each side of your entry or front stoop to create the same symmetric effect. You can even continue using the decor of your choice down the entire walkway, creating a lighted path for guests leading up to your cheerful door decor! When the door is done, it's time to head to the porch and stair railings! 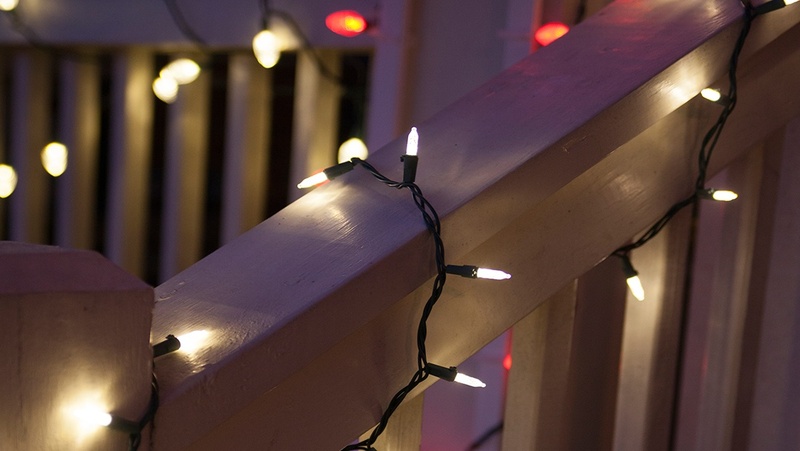 Continue your Christmas porch decorations by wrapping mini lights around railings or adding a delicate garland or icicle light swag. 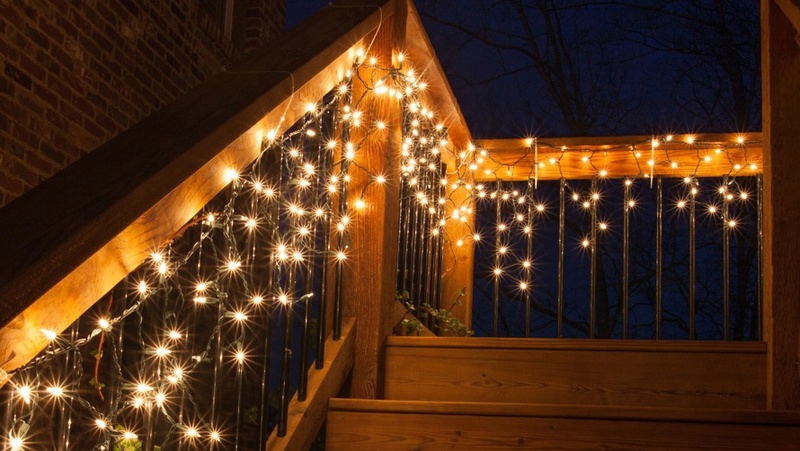 You could even secure a few lighted snowflakes to stairs and the outside of your railing resulting in a whimsical, wintry mix of Christmas cheer! Depending on which Christmas decorations you choose to use, the application may be different. We've provided a few helpful hints below to get you started on installing your preferred porch railing decorations. 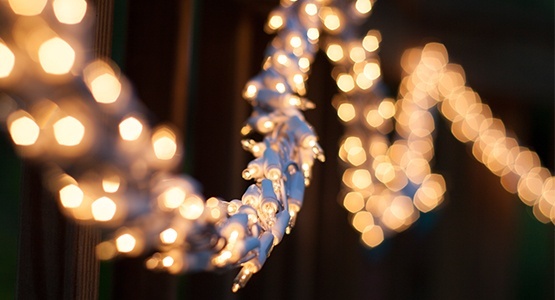 Icicle Lights can be hung straight across railings or secured in a sweeping swag pattern if preferred. Zip ties in colors to match your railing work best for temporarily securing icicle lights, just be sure you leave a small amount of give so as not to pinch your wiring! For long term installation or the ability to hang alternative light types through the year, consider using screw in hooks or clips to hang your lights. 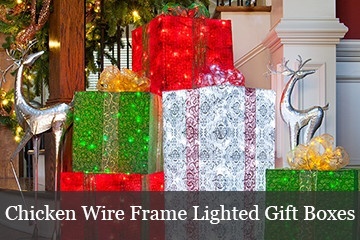 Garland Lights are made up of multiple strands of mini lights tightly woven together. 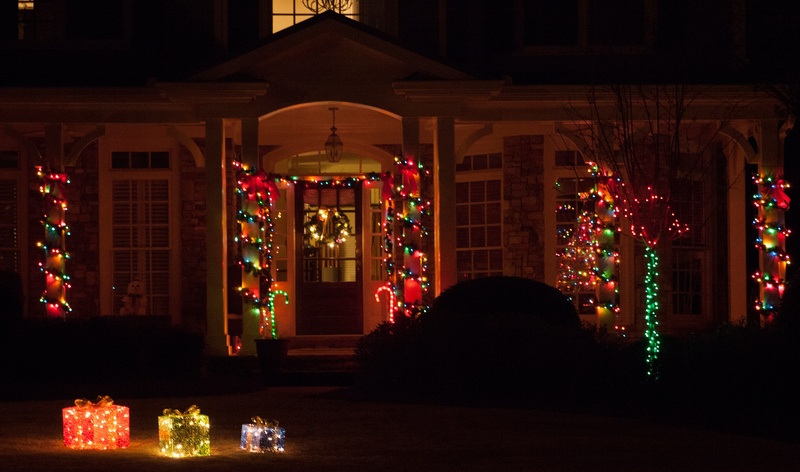 Garland lights can easily wrap around railings to produce a stunning display, or you can create a swag by using zip ties or hooks to secure the lights every few feet. 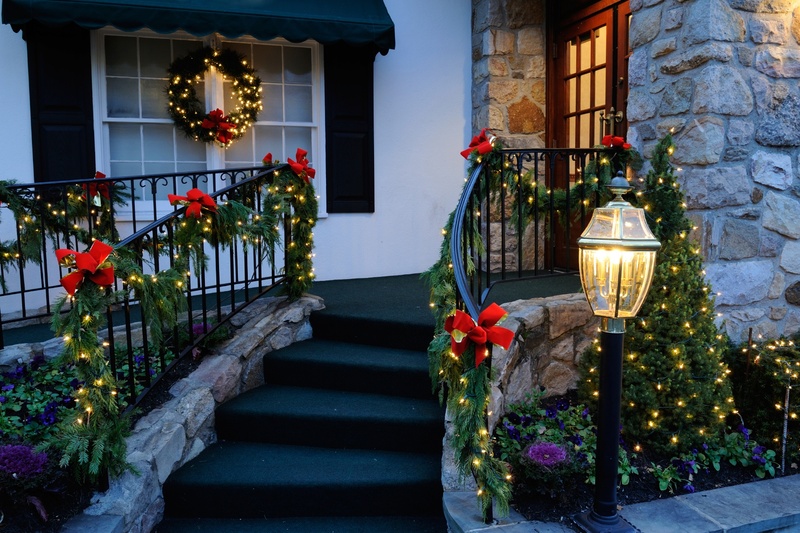 Garland lights also look incredible when used to outline the front door in place of greenery. 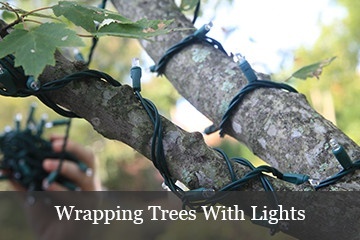 You can either use a greenery holder or a few nails or hooks to keep the lights in place. Lit or unlit Garland is most often wrapped around railings, but can also be displayed in a graceful swag. 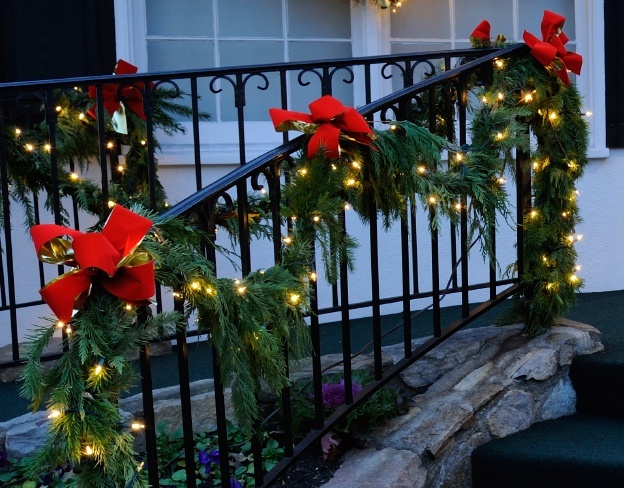 One popular idea for garland swags is to place a festive bow at the point where the garland is secured to the railing. Many bows feature sturdy wiring to hold them in place, which can be used to secure your garland to the railing as well. Tip: To ensure a garland length that is always just right, measure your area and multiply by 1.5 to find out the length of garland you will need. This calculation allows for draping or creating swags with the garland. Wide Angle LED Mini Lights- The 5mm LED bulb is smaller than your traditional mini light yet its concave lens produces a very popular starburst light halo that disperses light uniformly in all directions. M5 Mini Lights- What do you get when you mix traditional Christmas light shapes with LED technology and diamond faceted bulbs? An instant classic! C6 Strawberry Lights- C6 LED mini lights are a decorators dream! C6 lights strings are popular for illuminating bushes and trees because of their unique strawberry shape. G12 Raspberry Lights- Whether they remind you of raspberries or gum drops, G12 light strings are certainly a fun addition to any colorful and unique design theme! 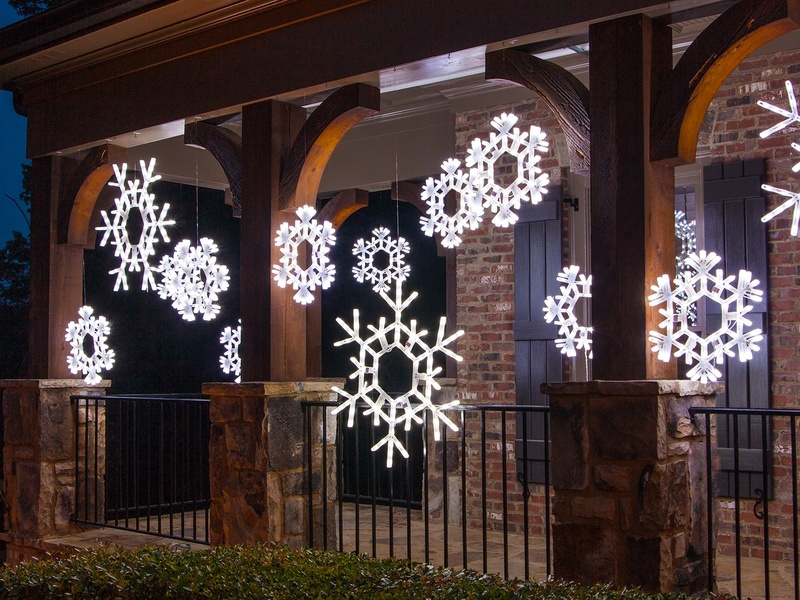 Snowflake Decorations whether lit or unlit, can be secured with sturdy wiring, zip ties or even decorative ribbons depending on their design. Hang snowflakes alone or in addition to mini light wraps. Christmas Wreaths for those who can't get enough holiday greenery! 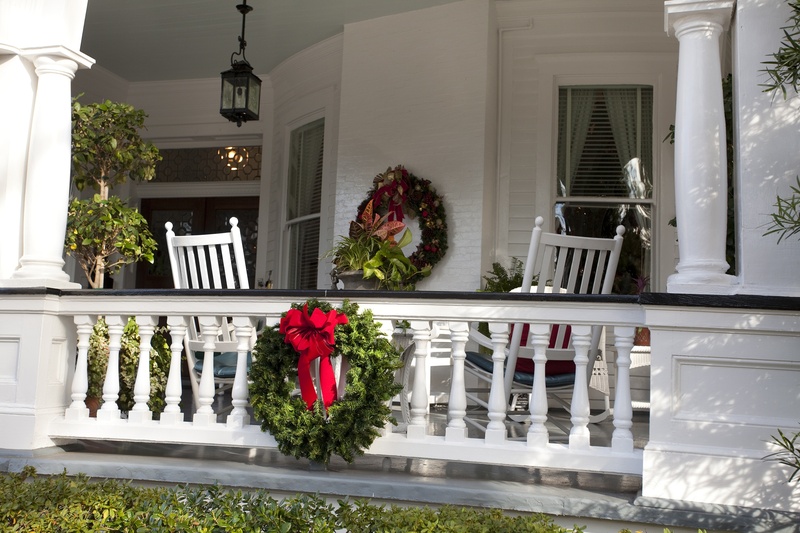 Hanging wreaths across porch railings with festive ribbon is a less common Christmas porch decoration, but one that is undeniably inviting and equally charming! Wreaths are a classic Christmas decoration and a great choice when you are wanting a festive holiday home that looks equally cheerful both day and night! Choose prelit wreaths if outlets are easily accessible or opt for unlit options and shine a spotlight on them to illuminate the greenery when night falls. Your front door is the focal point of your Christmas porch decorations, so think of your railings and columns as the frame, showcasing your design! The best method for decorating columns is to wrap them with lighting or greenery that either matches or complements your railing design. If you wrapped your railings in mini lights or used icicle lights you will want to also wrap your columns in lighting that is the same or similar. Icicle lights aren't typically used for wrapping, however you can find mini light strings in identical bulb types and colors to match your icicle lights. If you chose greenery for your railings, wrap columns in the same style greenery. You can even secure a matching bow to the top or middle of each column to tie it all together! 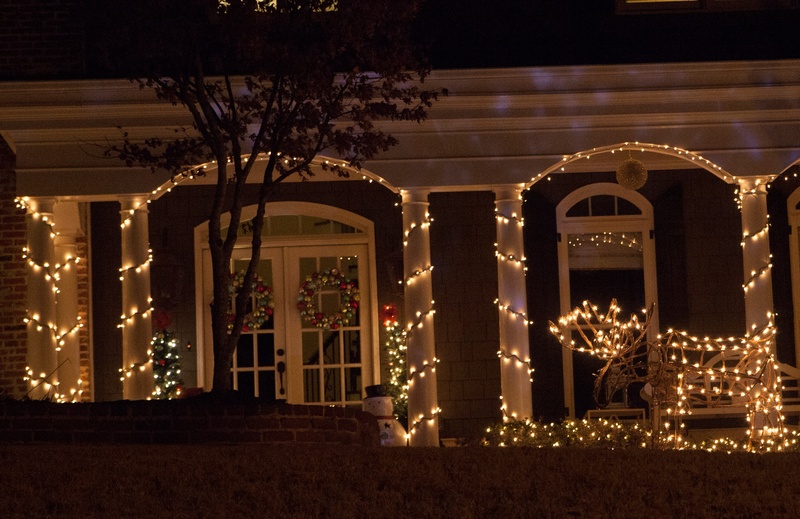 To make wrapping columns even easier and convenient, column or trunk wraps are available in several lighting and color styles to match your mini lights or icicle lights. Column wraps are especially helpful for homeowners with a larger porch and several columns to be decorated as they can be installed quickly and produce uniform results. 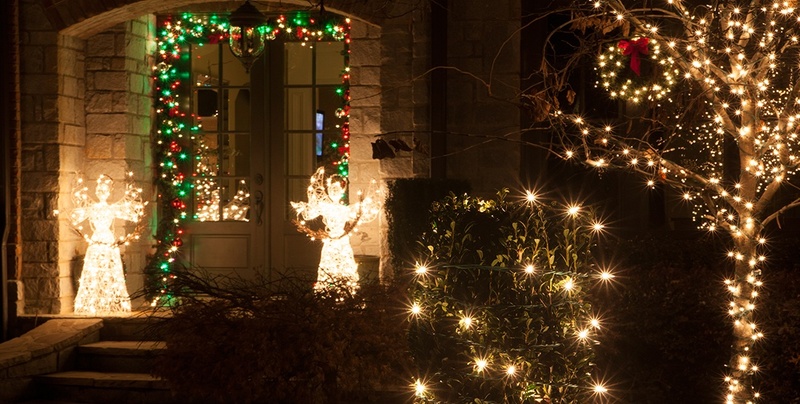 Pro Tip: If you're planning Christmas porch decorations that will glow with Christmas spirit through the evening, consider choosing energy efficient LED lighting to save on power and avoid the possibility of circuit overload. 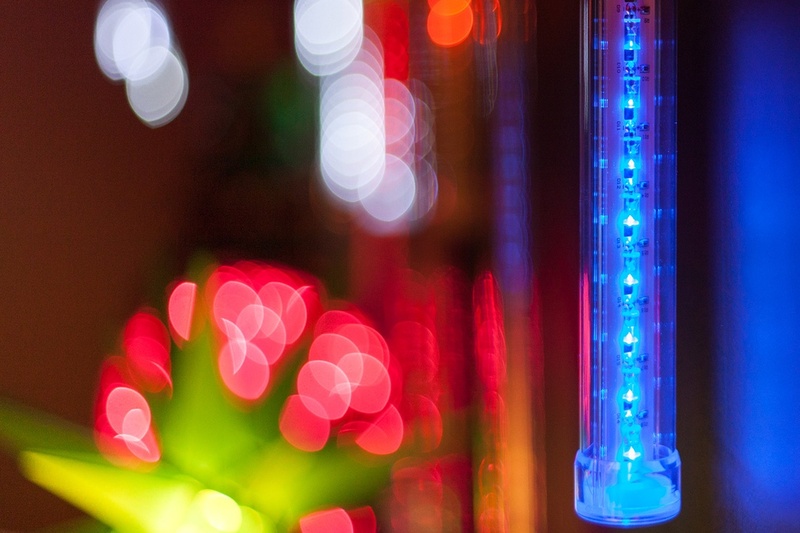 Read more about the benefits of LED Christmas lights. If the holiday spirit has you wanting even more, or you're looking to add something different and new to your existing decor, it's time to look to the ceiling! Hanging Christmas porch decorations are like the cherry on top of the sundae. If you've ever driven past a home that showcases stars and balls of light suspended in air or dripping lights that mimic the wonder of shooting stars, you've probably slowed the car, mesmerized at the spectacle in front of you! Inspire that same awestruck feeling by incorporating one or a few of our hanging decoration ideas across your own porch this year. Just be prepared to experience the slowing of cars past your house this Christmas! Starlight Spheres - you might have seen these glowing orbs hanging around the neighbors trees at night and wondered what they are and what magic keeps them floating there. Starlight spheres can be hung from tree branches in the yard or secured to hooks and nails across the porch to create the illusion of a floating constellation. Installing starlight spheres isn't magic, it's actually very easy, but the result is certainly enchanting! 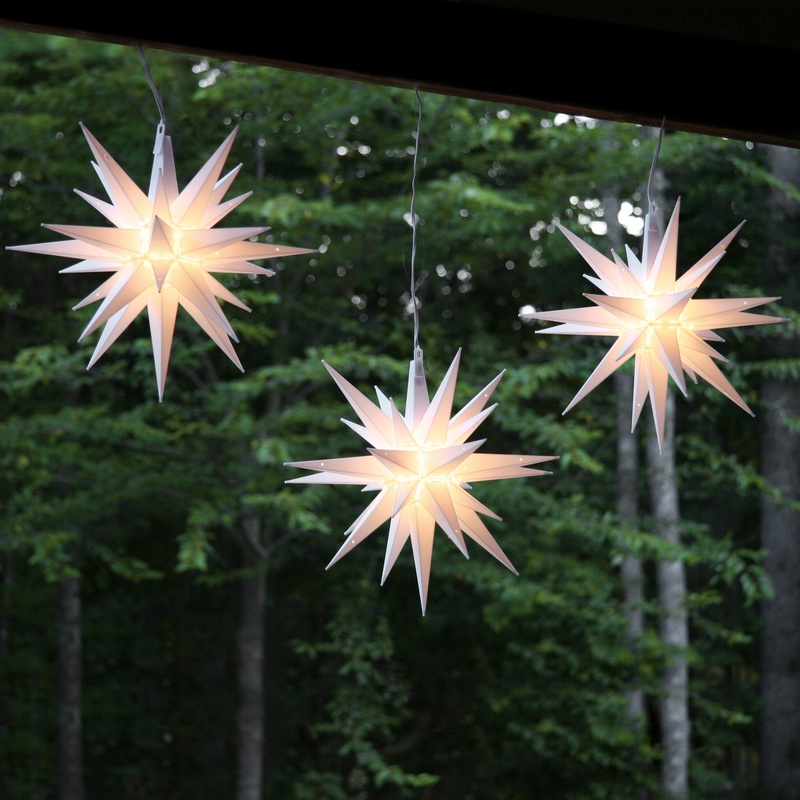 Moravian Stars have always been a symbol of Christmas spirit, however they are becoming increasingly popular as year round decorations as well! 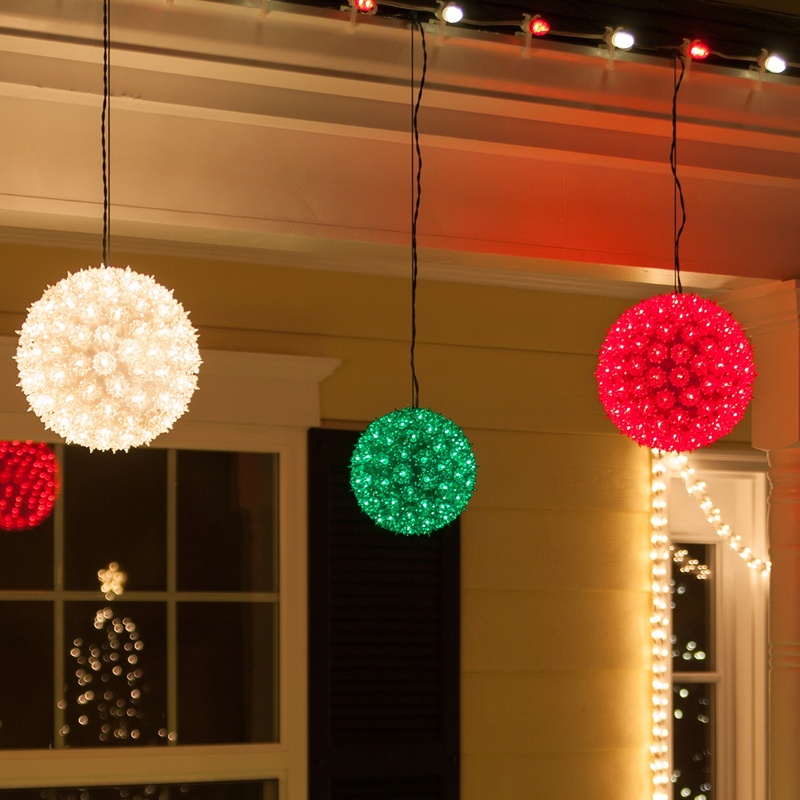 Choose starlight spheres in one or a few colors to complement your holiday theme and hang one between each column or several clustered across the ceiling to complete your Christmas porch decorations with lighted accents inspired by the night sky. Grand Cascade Tubes- by giving the illusion of dripping icicles or stars shooting across the night sky, grand cascade light tubes infuse your holiday porch display with an element of surprise, producing wonder and excitement! Alternate grand cascade tubes in different sizes across the entire front of your porch or frame the center and sides, no matter how you choose to design your animated display the result will be breathtaking! Love the ideas above? Pin your favorite photos or let us know on Facebook. We'd love to talk more about magical Christmas porch decorations! If you've worked hard on your porch and want to show it off, send us a picture too. We can't wait to see what you create!